Yoghurt, a natural source of lactose, proteins, minerals and vitamins, increases the water content of the epidermis' top layers and refreshes the skin. Cucumber extract and aloe vera soothe and nourish the skin, without leaving oily traces. Yoghurt is a rich nourishing ingredient; it is an essential food supplement, integral to numerous European and Asian dietary traditions. In addition to its nutritional properties, yoghurt makes an excellent cosmetic ingredient due to its levels of lactose, proteins, minerals and vitamins, which increase the moisture levels in the upper layers of the epidermis. Protein, a basic constituent of the skin, and lactose nourish and restructure the epidermis. These properties ‘wrapped’ in yoghurt’s cooling, soft texture leaves dry skin areas moisturised, soothed and refreshed. The wealth of minerals and vitamins [Calcium, Phosphor, Potassium, Zinc, and vitamins A, E, D, B2 and B12] also provide antioxidant protection and help reduce the visible signs of ageing. Lactic acid has anti-microbial properties, helping to fight certain skin disorders while yoghurt’s vitamins E and D, help relieve and heal sunburn impact. 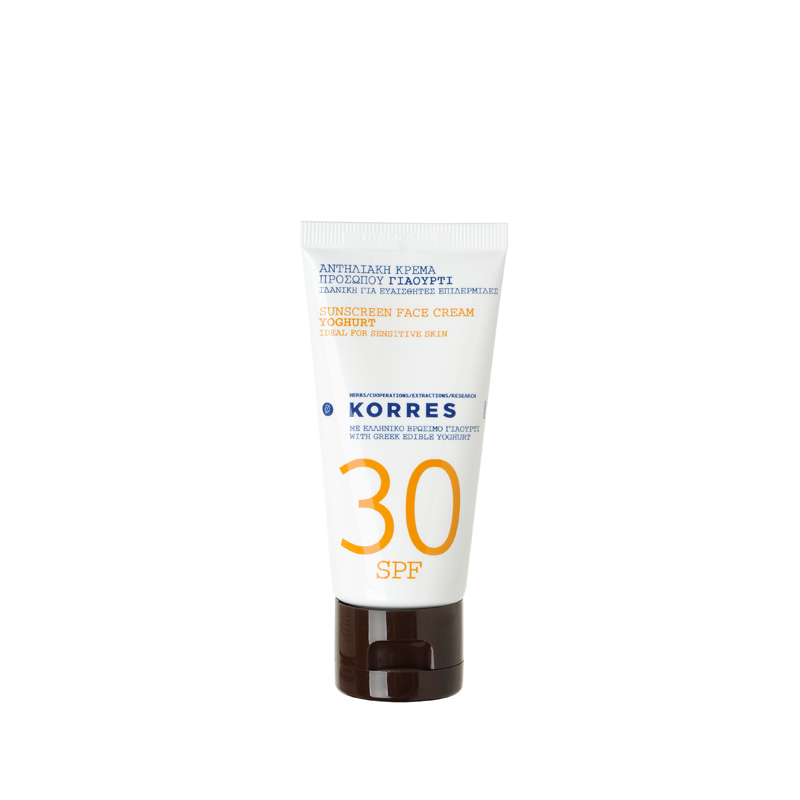 Apply evenly onto face and neck at least 30 minutes before exposure to the sun. Re-apply frequently to maintain protection, especially after perspiring, swimming or towelling. In order to reach the protection level indicated by the sun protection factor, sunscreen products have to be applied in a quantity that is equal to 2mg/cm² (approx. 1/3 teaspoon for face and neck). Not using the adequate quantity of sunscreen will lower the level of protection significantly. Do not stay too long in the sun, even while using a sunscreen product. Over-exposure to the sun is a serious health threat. Wait until the product is fully absorbed, before getting dressed. Sunscreens may cause stains on clothing. Shake well before use. Aqua/Water/Eau, Ethylhexyl Methoxycinnamate, Bis-Ethylhexyloxyphenol Methoxyphenyl Triazine, Triheptanoin, Diethylamino Hydroxybenzoyl Hexyl Benzoate, Ceteareth-20, Glyceryl Stearate, Glycerin, Alcohol Denat., Aloe Barbadensis Leaf Juice, C12-15 Alkyl Benzoate, Ceteareth-30, Silica, Panthenol, Dicaprylyl Carbonate, Ascorbyl Palmitate, Cellulose Gum, Ceteareth-12, Cetearyl Alcohol, Cetyl Palmitate, Cucumis Sativus (Cucumber) Fruit Extract, Ethylhexylglycerin, Galactoarabinan, Helianthus Annuus (Sunflower) Seed Oil, Hydroxyethyl Acrylate/Sodium Acryloyldimethyl Taurate Copolymer, Isohexadecane, Lactic Acid, Lecithin, Lonicera Caprifolium (Honeysuckle) Flower Extract, Lonicera Japonica (Honeysuckle) Flower Extract, Microcrystalline Cellulose, Parfum (Fragrance), Phenoxyethanol, Polymethyl Methacrylate, Polysorbate-60, Tetrasodium Glutamate Diacetate, Tocopherol, Tocopheryl Acetate, Yogurt.